Already in 2001, Prague has started to build its own 3D model of the city and since then, 3D data has been an elementary part of the data platform of the City of Prague. 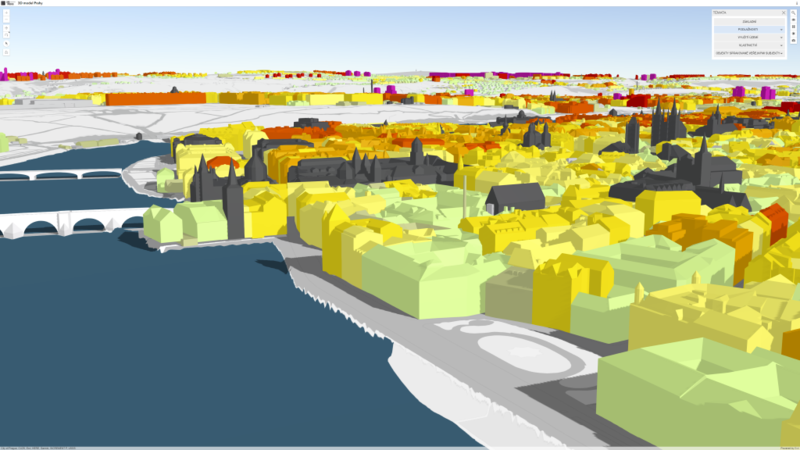 The core value of the 3D model is its supporting function for decision making in urban and strategic planning. Therefore, it is utilised as a data input for environmental and other analyses. 3D models in general can also serve as a communication tool in participatory planning processes for new developments or for revitalization processes in parts of the city. Prague’s 3D data is applicable on various fields and therefore, the city needs reliable tools to export 3D data into different formats without losing quality. To use 3D data for planning and analytical as well as participatory projects, data such as the topologically data has to be precise, reliable and constantly updated. However, the model missed a system for maintenance of its 3D data such as a system for web presentation and had difficulties to ensure high data quality. Therefore, a further goal is to update the 3D model through the implementation of a system of software tools for maintenance and web presentation and to improve the data quality. Before setting up the tender for the update of the 3D model, the spatial data section of IPR Prague analysed similar projects in other European cities. For instance, the 3D city models of Berlin, Zurich and Vienna were tested and a knowledge exchange with the Lighthouse City Eindhoven during the Follower City Days in 2017 took place. Afterwards, in 2018, a tender process for the selection of the provider of the technological update of the 3D model was published. Already in 2019, the update has been implemented and currently, the available geo data is undergoing an adaptation process. During the implementation process, three milestones were set to measure the progress of the implementation of the 3D model: Firstly, setting up and signing the contract with the supplier (in 2018), secondly, the implementation of the new system in IPR Prague´s environment (in 2018) and thirdly, launching a web presentation of the city model (in 2019).